We Want You…to be an Aurorasaurus ambassador! Want to become more involved with Aurorasaurus? We are seeking volunteer Ambassadors to promote Aurorasaurus in their local communities to groups, such as a photography or astronomy club, university department or student group interested in aurora. We are also interested in having your input on ideas for new website features and content. We will supply promotional materials and, where possible, will even arrange a guest lecture from local aurora scientists. The possibilities are endless, and we’d love to hear your ideas! Fill out this brief form and tell us why! There is room for one rep from each major geographical area. If areas have lots of interest, this position can rotate or possibly be shared. Note: this is an informal volunteer position and not directly connected to our sponsors. I’m proud to announce we want to put YOU on the map of Aurorasaurus as an official member of the new Ambassador Network (formerly known as the Scientist Network) which will include enthusiasts of all types, not just scientists! I was recently invited to Calgary to give a colloquium at the University of Calgary Physics and Astronomy Department. This was a great chance to collaborate with their researchers who are some of the world’s experts in scientific “all sky” camera observations of the aurora and have resources across Canada. 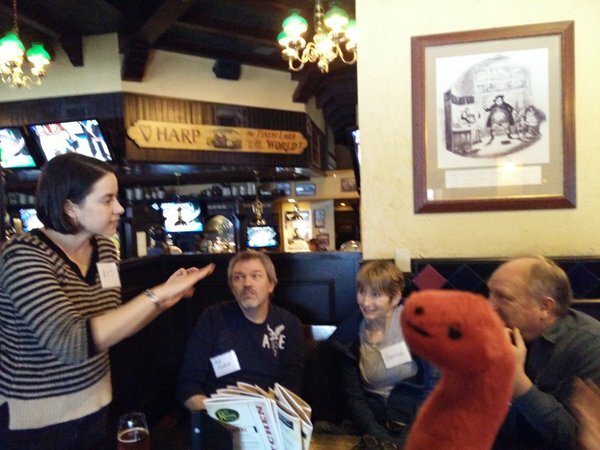 It was also a fantastic chance to connect with the Alberta Aurora Chasers group in person and help to introduce the two communities– the University of Calgary researchers and the Alberta Aurora chasers– to each other. The scientists had no idea of the dedication and interest level of the Alberta aurora hunters and we hope that there can be fruitful collaborations going forward in terms of auroras, outreach, and more. Thank you so much for your passion and volunteering with us! This entry was posted in Getting Started with Aurorasaurus. Bookmark the permalink.